The company thrived and during World War II, when food was being rationed nationwide, the government encouraged home gardens and fruit orchards. Benton County Nursery aided this effort by offering a Victory seed collection which included a large variety of vegetable seeds for 65¢ and a fruit orchard kit with enough trees for one acre, over 1000 plants, for $60. The company appealed to “regular” folks and described themselves in their catalogs and literature: Who we are . . . We are a bunch of old fashioned, hard working blue-eyed hill-billies, who grew up right here in these Ozark Mountains, on the farm, and made our living from what we could grow out of this mountain soil and all we know is to treat you exactly like we would want you to treat us if we were in your place and you were in ours. The business was always a family owned business while T.L. Jacobs was living. A 1943 company booklet described the nursery family: T.L. Jacobs, President; Mrs. T.L. Jacobs, Vice-President; Verna Jacobs Rhoads, Secretary; George W. Eoff, Landscape Gardener; Lee Jacobs, 2nd Vice-President; Russell Driver, Mgr., Seed and Plant Dept. ; Maxine Jacobs Driver, Advertising Manager. No one knows why the company declined in the early 1960s, but the company filed for bankruptcy on May 3, 1963, ending 48 years of service to the nation. It is gratifying to think of the many fruit trees, shrubs, flowers, and assorted plants that continued to produce food and pleasure around the nation for decades after the company closed. Benton County Nursery from a 1949 catalog. 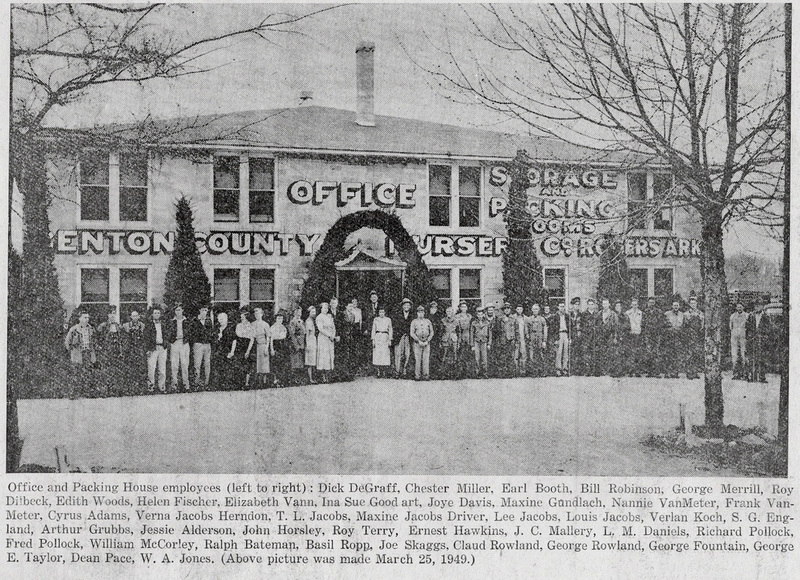 The yearly company catalogs included a picture of this building with the current office and packing employees. You may recognize some of your family or friends in the picture. Picture from the 1949 Nursery catalog. The road is Highway 71 S. and Daisy Mfg. was later built just to the right of the main building.